Young workers and workers with limited experience are at greater risk of health and safety incidents. The perfect time to connect workers with the education they'll need to be safe in the workplace is when they are students. As students graduate and prepare to enter the workplace of their choice, they are preparing in many ways to encounter a much wider world than they will have experienced before. Workplace health and safety education should be considered a vital set of materials to present to these students. According to a study done by the Public Health Agency of Canada on Occupational injuries in Canadian youth, "Inexperience, inadequate training and differential hazard exposure may contribute to a higher risk of injury in young workers." One way to reduce injuries is to provide training on hazards that be commonly found in many workplaces. Raising the knowledge and awareness of such hazards helps equip youth with the ability to keep themselves, and others, safe. Many young people need jobs to begin to build skills and earn money, as well as other benefits. However some have even suggested that the risk to such inexperienced workers is so high that the potential risk for injury outweigh the benefits. Indeed, any workplace accidents that happen to youth can leave one with a long-term health effect that will impact the rest of his or her life. Because of the nature of this phase of life, youth often find themselves entering into employment situations that are casual, temporary, seasonal or contract-based. Informal jobs or jobs that can be classified as self-employment are common for youth or students. For example, babysitting, farm work, or work with family businesses are often readily available jobs. And its these types of jobs that typically do not provide formal training and safety training is rarely required. Students who are new to employment may be unaware of best practices when it comes to workplace health and safety. They may be unaware of training that is available to them or commonly required for even jobs that they are considered able to do with little to no training. Even if they know there is training they might require for certain tasks, youth may feel they are unable to request training because they feel powerless or intimidated by their older, more mature or more powerful employers. Identifying and acknowledging the need for training is not the responsibility of the student. Providing students with more than just a cursory safety orientation is important. The choice to train up new workers by giving them health and safety training when they are just starting to enter the workforce, is a responsible choice and gives them the foundation they need to keep themselves and others safe for life. Students should be afforded the opportunity to learn WHMIS before they enter the actual environment in which they may be encountering hazards. Providing training to students sends the message to our greater society in general that we value health and safety of the public by ensuring we have health and safety in the workplace. Giving students the education they'll need to be safe reduces the chances of a young person being put at risk for injury, or worse, incurring injury, potentially changing their life forever. WHMIS training helps students to be more aware of potential hazards, like hazardous materials protocol, accident procedures, and more. Consider protecting your students who go out on work experience. You can't know what each business has in the form of cleaners, chemicals, flammables, compressed gases, or other controlled products that represent a hazard to workers health and safety. When your students go out on work experience they'll face the same hazards as the employees who work in that business every day. But students are more at risk of hurting themselves or others due to their inexperience. When young workers receive education and training, there is a significant reduction in injuries and the potential life-time repercussions of those injuries. Giving them the same WHMIS training trusted by thousands of businesses enables them to be safe. Many job seekers are looking for an edge that will set them up as the most attractive candidate for an interview. 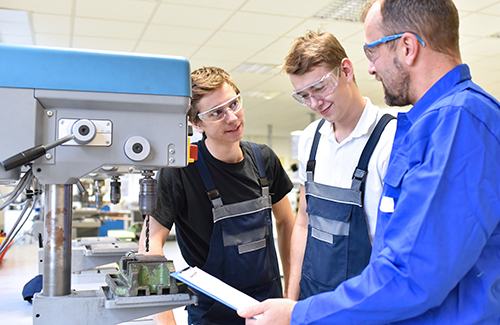 WHMIS training looks great on a young person's resume and the ability to show a prospective employer you have a basic understanding of WHMIS can give students a distinct advantage. Students with WHMIS training on their resume possess a recognized workplace credential, which makes them more employable. Employers want to hire individuals who have some valuable skills even while they are in the beginning stages of starting to build work experience. Employers who value safety in the workplace will see that students with WHMIS training will enter their corporate culture with the same high priority on safety. Employers who note that a student has WHMIS training also know that a safer employee protects the company from risk in the form of financial loss or property damage, and contributes to productivity and corporate reputation. Along with increased training such as what is provided by WHMIS, a young person gains a valuable increase in confidence. A young worker with WHMIS training is a young worker who will be able to absorb other important on-the-job skills because they will not be as worried about risks to their safety. Young workers who are confident will do better at their tasks. If a student can actively identify, access safety equipment for or correct potential hazards as they happen in the classroom and then in the workplace increases their leadership skills and shows mature initiative, which can set them up for success. A worker who is dependable to be safe and set an example for others is a worker who is more likely to be promoted and reach greater earning potential. At safeandcertified.com, we work with schools to provide WHMIS awareness training. This provides students with the knowledge of what controlled products are, how to read product labels and the hazards that each class of controlled products represents. Home / Articles & Resources / Do Students Need WHMIS On Work Experience?